The Money Stats are out today showing for the first time that private debt has topped £1.5 trillion. To put this into perspective, the average adult in the UK now owes almost £30,000, or 113.3% of average annual earnings. This figure has grown by £1036.58 over the 12 months to September and is expanding at the fastest rate since before the financial crisis in 2008. Debt fell for a few years after the crisis, but has begun to rise since 2013, though not quite at the rate seen in the early 2000s. £30K each means that the amount we owe on our mortgages, loans and credit cards is now 82% of what the entire economy produces in a year. 87% of this debt is mortgages, so is secured against property. 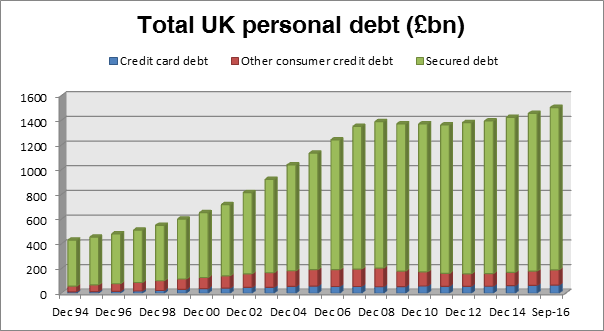 But the 51 million adults in the UK also owe an average of £3,737 in unsecured debt like credit cards and personal loans. Borrowers should be aided by the Bank of England’s decision to cut the base rate to0.25% in August. This should bring down the interest rates people pay, but so far does not seem to have impacted hugely on the rates that all consumers face. Mortgage interest is a little down, but average credit card interest crept up from 18.29% in August to 18.42% in September. With the possibility of inflation and rate rises just around the corner, people should be getting ready for a time when this debt mountain is more difficult to deal with. Public Sector Net Borrowing (excluding public sector banks) was £10.6bn in September 2016, meaning that the Government spent an average of £353m per day more than it took in during the month (equivalent to £4,090 per second). Citizens Advice Bureaux across England and Wales dealt with 598,747 new enquiries in the three months between April and June 2016. 104,000 people (1,322 a day) reported they had become redundant over the three months, up 166 a day from the previous quarter. The Office of National Statistics say that the average house price for first-time buyers was £184.423 in August 2016, which is an annual increase of 8.2%. Get the full picture, and many more fascinating facts about money in the UK in our monthly Money Statistics. Order your FREE copy of the Student Moneymanual Today!